Nesting is a very real phenomenon. Of course, before becoming a mom myself, I thought nesting was just an excuse to decorate a nursery. But in actuality, I learned it’s a legit thing, and it’s quite therapeutic. And now — at nearly 33 weeks — I’m finally in the nesting stage … and there’s no turning around! It took a while because we were moving and then organizing the new house and maintaining the old house … and, well, a nursery for an unborn baby was at the bottom of the priority list. Sure, I did some online shopping for his bedding and gathered some ideas from Etsy and Pinterest for decor ideas … but that’s where the “excitement” came to a screeching halt. The thought of another house project just made my stomach twist. And I didn’t feel a ton of pressure to make the transition from crib to bed because we had converted Maya’s crib into a toddler bed this spring so we knew she’d be ready for her big girl bed whenever we were ready to make some headway on Baby H’s nursery. Though we still have some rearranging of furniture (and wall decorating!!) to do in both rooms, both kids now have beds. Maya was a big help tonight putting her baby brother’s crib together. She didn’t even seem that jealous … probably because the prospect of her new Big.Girl.Bed. was so enticing! It was fun watching her mimic Luis with tools, pretending to “fix” things like Daddy and, because she’s used to a [smaller] big girl bed, she went to bed in her new bed without a hitch. Here is Maya being silly in her big girl owl bed. We still need a body pillow for the side and to hang all her wall hangings up — including her name — but I love how her room turned out … even though the lime green paint she chose is REALLY bright 😉 I’ll take more pics in the coming weeks. 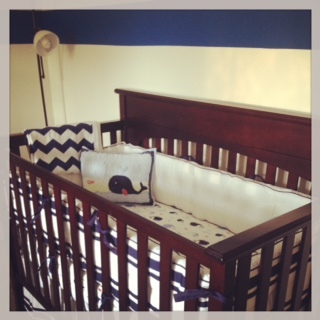 And here is Baby H’s crib (minus the mobile, arriving this week) — whales/nautical themed. I know it’s so cliched to do a blue room for a boy, but I really love the combo of navy and white. I originally wanted all-navy walls, but my mom and Luis convinced me it would be too dark for a baby’s room, so instead Luis [meticulously!] painted a thick navy stripe all the way around the room, and I’ll put his name — when we know it — in painted wood letters hanging by ribbon, like I did for Maya. Also I have a navy changing pad for the changing table and navy blackout curtains, so I think I’ll still get my blue fix even though the room is still mostly white. It sounds silly but just getting his bed together … putting the mattress up on the top level … was monumental; an acknowledgement that, although I still don’t feel super-connected to him yet, he is coming soon and between doing this and hanging up all his little clothes … I couldn’t help but feel schmoopy. And glancing in at my [daytime] potty-trained two and a half year old asleep in her big girl bed, I had to smile. 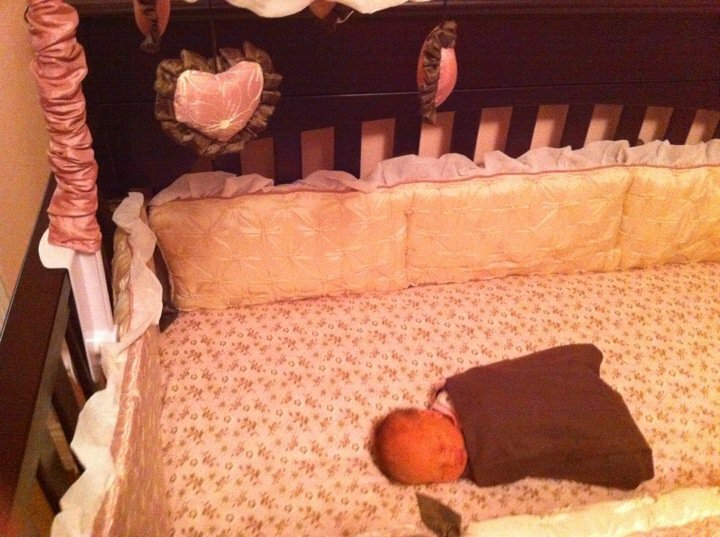 She looked so tiny in that bed, and I remember when she looked so tiny in her crib (when she was four days old; right after we got home from the hospital). She is going to be an amazing big sister and we can’t wait to meet her little brother … let’s just pray he holds out til 10/3 🙂 Mama has plenty more nesting to do! 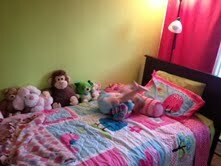 Both Maya’s bed and baby’s crib look great! I really love the whole navy nautical theme for the baby. The stripe looks great on the wall!